Using the natty alpha2 candidate, opening the application place works on first click but hidding and showing it again often result in an empty place, typing something in the search entry and cleaning it bring content back though. I can confirm this bug, and I'm using alpha 2 candidate. Also, sometimes closing the 'emptied' application menu crashes Unity, is unable to recover and leaves the desktop empty from all panels, and only desktop and open windows are visible. confirmed. I experienced this using natty alpha 2 i386 20110202 LiveCD and full installation. I also confirm that : fresh install of Natty alpha2 64 bits. After startup, first click on Applications icon on Unity dock opens the window with application list, but we can not scroll down to the bottom. If I click on an application icon, it opens well the related program. (see first printscreen). 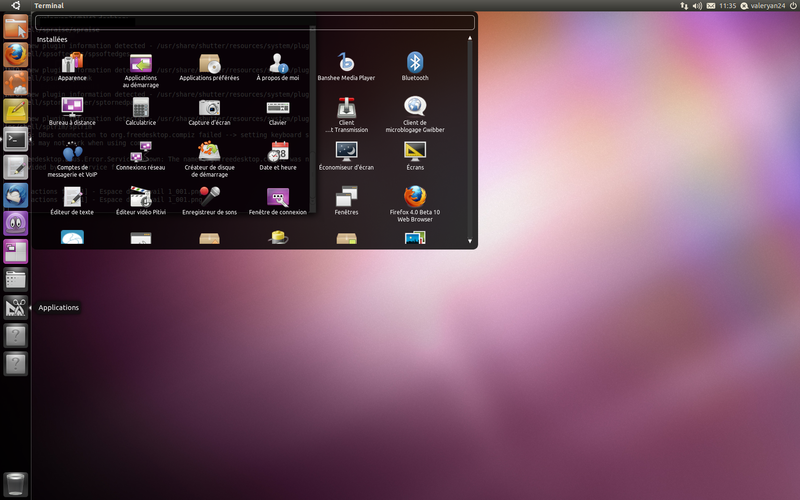 Often also click on Applications makes Unity crashing (top panel and left dock disappear, keyboard becomes inactive). Second click on "Applications" always opens an empty window (see second printscreen). Then if I enter a letter on the search bar, applications containing this letter appear, if I erase this letter I get the normal window back with all icons listed and this time the scroll bar works. My applications list is blank, and it's not updating at all no matter what I type.